New York City in the winter time is the perfect destination for your next couple’s getaway! This city holds so much charm, romantic restaurants, and unique experiences. In this guide, I will explain the best time to go to New York City, where to stay, winter packing essentials, and a detailed 5 day itinerary. If this is your first time to New York City, I would tack on an extra day to see the famous sites such as Empire State Building, Statue of Liberty, and Wall Street. I have an entire guide for 48 hours in New York City you can check out that covers these sites. Or if you are just there to take fabulous pictures, check out my guide on 9 most Instagrammable spots in the city! The best and most popular time to visit New York in the winter is of course, New Year’s Eve. They host the famous ball drop in Time Square and still have all of their popular Christmas Decorations up. Plan far in advance and plan to spend A LOT of money! If you want to avoid NYC’s New Year’s Eve at all costs (like a big chunk of the population), go before Christmas so you can go Christmas shopping at all the outdoor markets. This way you will get to see the entire city lit up in decorations, shop for the best sales, and can avoid the hectic crowds of New Years! If you want to beat the crowds and get the best price, go after the Rockefeller Tree is down. The second they take this tree down, all hotel and airline tickets drop significantly. I recommend staying in Time Square if it is one of your first times in the city. You will be within easy walking distance of all the popular sites and restaurants. The best hotel for Time Square is The Crowne Plaza Hotel. It is right in the center of Time Square, giving you the best views! It is also extremely fairly priced compared to others in the area and gives you free drink coupons when you check in. If this is not your first rodeo and want to branch out a bit, I highly recommend staying near The High Line in the Chelsea district. This area is trendy, not as touristy, and still so close to all the famous sites you would want to see. The best hotels for The Chelsea District are the Stewart Hotel and Hotel Hayden. Multiple Beanies to keep your head and ears warm. I also want to disclose a secret…. NYC is extremely windy. Which means, your hair will look awful at all times… there’s just no way around it. Except for a beanie. I would stick to neutral beanies with colorful clothes or neutral clothes with a colorful beanie. This one comes in packs of two and every color you could ever want! Thermal under layers are not the cutest thing in the world, but if you are wearing jeans, a sweater and a big coat over… no one will notice! Like I said, it is extremely windy in New York City, so you will thank me later for that extra layer! Central park is home to so many movies scenes, TV shows and famous historical moments. In the winter time, it brings the magic alive because there are not many people wandering the park and you will feel like you have it all to yourself. 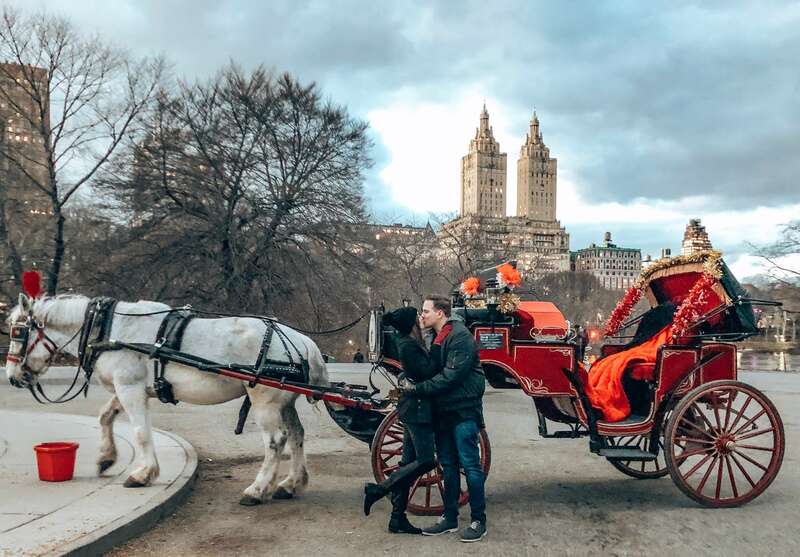 When you arrive to central park, you can see multiple tours for horse and carriage rides that will take you around the park and point out the most important sites. This is the warmest way to see Central Park because they will bundle you up in big, fuzzy blankets! NYC Horse Carriage Rides is a family owned business that has been open since 1979. Not only will you get an experienced and knowledgeable guide, but he knows all the best picture spots to make your memories tangible! Riding a horse and carriage through NYC’s famous central park is on every girls bucket list! It’s so romantic, picturesque and a special memory that you will never forget. Instead of asking for a tangible gift for Christmas from my boyfriend, Joseph, I asked for a surprise date night! I always prefer experiences because it creates a memory and ends up being a gift for both of us! I think he did pretty good didn’t he!? Next up, get in a cab or Uber to Catch. This trendy seafood restaurant is known for its extravagant cocktails, signature “Catch” sushi roll, and rooftop bar. Make sure you don’t go too late because after 11pm, the entire upstairs turns into a night club! Head over to midtown to get your touristy fix. First stop of the day is lunch at Grand Central Station. When you walk down the stairs into the station, you will walk the same steps as famous actors and actresses. From there, you can pick the endless restaurant options depending on your budget and what you are in the mood for. There are 4 fine dining restaurants, several bars, and a cafeteria style hall on the bottom floor. You can see pictures and browse menus here. Once you decide on your food choice, sit down and watch hundreds of strangers pass by that are either coming home or traveling somewhere new. After your belly is fueled up with food, walk over to the Rockefeller Center (10 minute walk). You can spend an hour or so ice skating in the famous Rockefeller plaza! If you time it right, you’ll still get to see all the Christmas decorations. How romantic is it to ice skate in a famous rink, hand in hand with the person you love? And the best part is, your day isn’t over yet! TIP: They keep to a tight schedule to keep the ice rink in perfect condition. You can find the Rockefeller Ice Rink’s schedule and rates here. After your hands are freezing from the cold, head inside of the Rockefeller Center to buy your tickets to the Top of the Rock where you can soak in the view of the Manhattan skyline. Most people go to the Empire State Building to get their picture-perfect view of NYC, but Top of the Rock is half the price, half the crowds, and twice the views! Not only do you get the same view of the Empire State Building, but you get the Empire State Building in your view! Tickets will range from $35-$45 depending if you go for sunset (which I highly recommend spending the extra $10). These do not need to be purchased in advance and can be bought right before heading up. Stop #4: Dinner and Wander Times Square! If you like ramen, go to Nippori off 51st & 8th. If you go between 5pm – 7pm, they have a killer happy hour! They also have sushi, full page of appetizers, grilled skewers, and much more. You can check out their menu here. Spend the remainder of your night playing tourist in Times Square. You can watch street performers, get cheesecake at Juniors, or grab a hot chocolate or people watch. Brooklyn will give you a totally different feel of NYC than in any other district. It’s slow-paced, trendy, and picturesque! If you are a baby to the cold (like me), take a cab/uber across the bridge and get dropped off at DUMBO. You can walk along the bridge, take some photos and then grab some lunch in one of the many restaurants nearby. TIP: Take your pictures on the side closer to DUMBO, so you get the skyline in the background! Snap a picture at the most picturesque spot in all of NYC (Water and Washington)! After you are done exploring Brooklyn, catch a ride to the best bar in NYC: 230 Fifth Rooftop Bar. During the winter months, this unique bar turns its rooftop tables into heated igloos! If you arrive before 9am, it is free to access them and it’s on a first come first serve basis. At 9pm, the entire bar (rooftop and inside lounge) turns into a night club. Split a bottle of wine with your hot date and dance the night away with a spectacular view of the Empire State Building! I was so young when this tragedy hit that I don’t even remember it happening, only the stories from the years following. This museum holds pieces from this day like parts from the Twin Towers, stairs that the victims ran down, letters from the offices, phone call recordings, fire trucks, news clips and so much more. As you walk through the museum, it will be virtually silent as everyone listens to the recordings and reads the descriptions on the walls. There will be one large room that holds a minute-by-minute timeline of the events that happened on 9/11/2001. It starts off with the news broadcasts that were showing that morning, before the attack. They were so irrelevant, about politics and weather predictions. Can you imagine being the newscaster that morning, talking about meaningless stuff like political drama while one of the biggest tragedies is happening at that very moment? You’ll leave the museum with a heavy heart and open mind to the trauma this entire city faced. You will walk outside to see the beautiful fountains that took the Twin Tower’s place and the even larger, One World Trade Center – symbolizing hope for New York City. After you take your time learning about this important piece of history, head back to Time Square for some lunch. To lighten the mood for the night, walk around Time Square until you find someone selling tickets for the Broadway Comedy Club. We did this very last minute when we went, and was our favorite memory from the trip! Tickets are SO cheap ($10-$20 per ticket). They give you different day and time options to choose from and is in walking distance from Time Square. These comedians are hilarious, especially after a few drinks! A trip to NYC is not complete without a New York Style Bagel! We got our fair share of bagels on our trip, but Best Bagel & Coffee was BY FAR the best! My mouth is drooling just thinking about it. TIP: Get the sausage, egg and cheese on an everything bagel… trust me on this one. Going to New York in the Summer? Don’t forget to check out my guide on 48 hours in New York City where you can see a round up of all the famous sites! Pssst… Don’t forget to check out my guide on What to pack for a winter vacation & 10 Travel Essentials You Can’t Live Without!